Reservations are now open for two new character dining experiences at Disneyland Resort. You can now make reservations for for Mickey’s Tales of Adventure Character Breakfast at Storytellers Cafe and Donald Duck’s Seaside Breakfast at Disney’s PCH Grill. 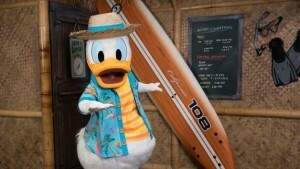 Both of these new character meal experiences begin July 10. Mickey’s Tales of Adventure Breakfast features a Farmer’s Market Buffet of all-you-care-to-enjoy food including made-to-order omelets, Mickey waffles, fresh-baked goods and seasonal fruit. This buffet is offered Mondays-Thursdays from 7-11:30 a.m. and Fridays-Sundays, from 7 a.m.-2 p.m. Reservations can be made online. 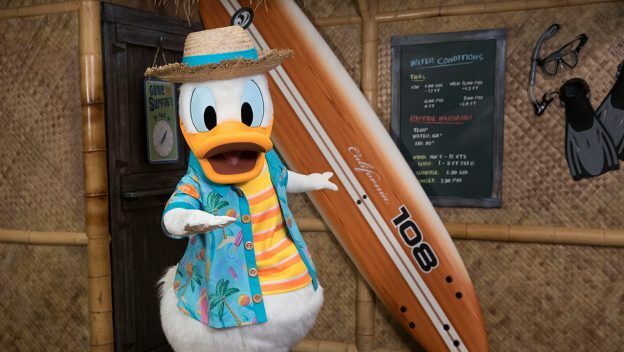 And, Donald Duck’s Seaside Breakfast features Donald, Daisy, and Stitch and guests can enjoy a buffet with a build-your-own-parfait stations, chef’s signature flatbreads, egg white frittatas, chilaquiles, smoothies, smoked salmon, and more. Kids can nosh on Mickey waffles, Minnie pancakes, Bananas Foster French toast and a selection of hot and cold cereals, sausage, bacon, and seasonal fresh fruit. This buffet is available Mondays-Thursdays, 7-11 a.m. and Fridays-Sundays, 7-11:30 a.m. Reservations can also be made online.